From your head to your shoes, just about anything can be a spot for stubborn, stuck-on gum. Learn how to remove it using common household supplies and a little elbow grease. Let’s face it: We can all be a little clumsy, especially with gum. If you drop a piece on the floor while chopping an onion or someone gets Big League Chew in your hair, worry not—gum can quickly and easily be removed from just about anything. Get the gum out with a tried-and-true standby: peanut butter. Plaster the gum with creamy peanut butter using your fingers or an old toothbrush, and then wait a few minutes. The fats and oils will stiffen the gum and make it less sticky, so it’ll be easier to gently work out of hair. Use a towel to wipe up every last bit of peanut butter, and give hair a wash afterwards. If you don’t have a jar of peanut butter, grab some Vaseline, toothpaste or vegetable oil. Such oily substances will lubricate the hair, helping the gum slide away. Apply to the glob of gum and gently work it in with your fingers, taking care not to squeeze too much. A wide-tooth comb should help the gum come right out, leaving hair free of the sticky goo. As with peanut butter, it’s not a bad idea to wash the hair once the gum’s gone. You probably don’t want to cover clothes in peanut butter or cooking oil. Luckily, good old-fashioned ice can harden gum and reduce its stickiness. Remove as much gum as you can with your fingers, then place a few ice cubes in a freezer bag and place the bag on top of the remaining gum until it has stiffened. Gently peel the gum off, then scrub away any remnants with an old toothbrush. You can also remove gum using the multipurpose hero of every home: white vinegar. Heat the vinegar in a small pot. Once it’s hot, dip in a toothbrush, and use this to scrub the soiled garment. Give it a little elbow grease and the gum should come right off. No matter how you remove gum from clothes, you’ll want to give them a cold-water wash afterwards to remove tiny specks that may have worked their way deep into the fabric. As it turns out, getting gum on carpets or fabric upholstery isn’t the end of the world. 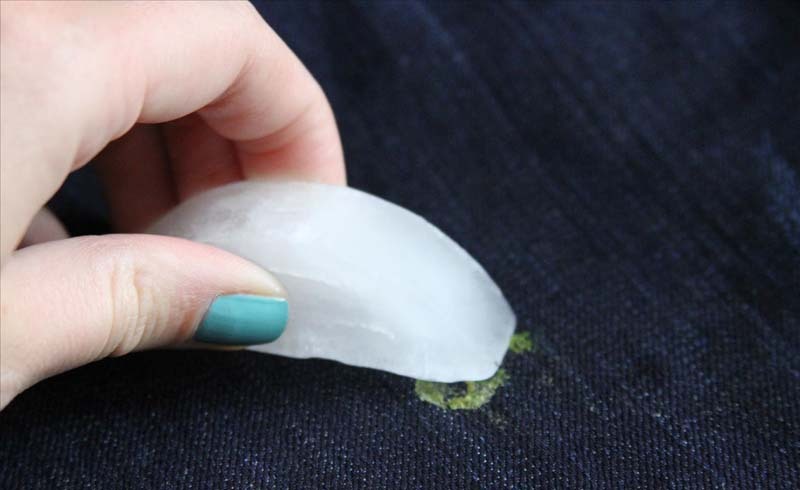 Rather than busting out the scissors, revert to the clothing method and freeze the gum before flaking it away. Alternatively, you can use oil—here are some to choose from—to weaken the gum and make it easier to remove. Rub the gum all over with an oil-soaked cloth and wait for about 10 minutes, then gently peel it up with a butter knife. Be sure to test an inconspicuous spot of the carpet or upholstery first (to make sure the oil doesn’t wreck the item), and clean the gummy area with dish soap and warm water when you’re done to remove any residue. Next time you’re out for a stroll, take a look at the sidewalk. You’ll probably see wads of dried-up gum just about everywhere you look-or, worse, fresh gum eagerly awaiting a ride on the bottom of your shoe. If you get home and discover you’ve picked up a chewy hitchhiker, give it a spray with some WD-40. After about a minute, the spray will dissolve the gum, making it a cinch to wipe away with an old rag or paper towel. If you’d rather not break out the grease and you have some time (and extra shoes) to spare, leave the gummed-up shoe alone for a few days. The gum will harden on its own, and you can remove it with your fingers or a butter knife.